Dream in Green’s WE-LAB (Water and Energy-Learning and Behavior) program has had a busy and exciting fall. WE-LAB brought on a new coordinator to oversee the different programs including WE-LAB Schools and workshops in Broward and Miami-Dade County. The Academy’s WE-LAB School program kicked off its semester with schools completing their 4 Pillars Challenge including creating a Green Team, taking a green pledge and conducting water/energy surveys. This year The Academy has 26 schools participating as WE-LAB schools, 10 more than last year. WE-LAB has also expanded and made its official debut in Broward County. Heal the Planet invited DIG’s Program Coordinator Alexandra Ender to offer a workshop at their World Food Day event on Las Olas last week. 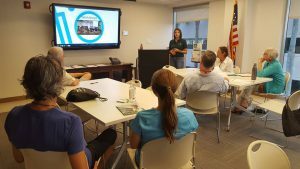 Members of the City of Fort Lauderdale’s Sustainability Division joined DIG to talk about the City’s conservation efforts and incentives for its residents to conserve water and energy. A grant from The Community Foundation of Broward allows WE-LAB to offer free workshops to the City of Hollywood, City of Hallandale Beach, City of Fort Lauderdale and City of Miramar. 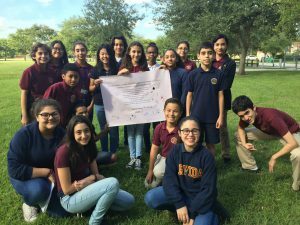 In addition to expanding into Broward County, DIG recently received funding from the Environmental Protection Agency which will allow DIG to offer 10 free WE-LAB workshops in Miami-Dade at schools, libraries or community centers. DIG will hold the first of these workshops at Dante B. Fascell Elementary, a WE-LAB school participant, on November 16, 2016. DIG is excited about the expansion of WE-LAB and reaching more residents and students to educate them on the water and energy nexus and promote sustainable behaviors.